Our apartment in Ramallah has thick stone walls, only covered with a thin layer of plaster and paint on the inside. Hanging pictures is a chore, an art, an impossibility. No nails, not even cement nails are willing entrants. Window treatments are heavy roll-down shades, installed on the outside and not given to looking cozy. The rooms look stark and cold with all that stone and no draperies of any sort, so I’ve decided to whimsy up the spaces with some light, airy curtains. Spring tension rods seem to be the solution for hanging them as they do not require the hammering of fixtures into the stone walls. How to find tension rods in this little Arab town? Home Depot, you say? I think not. 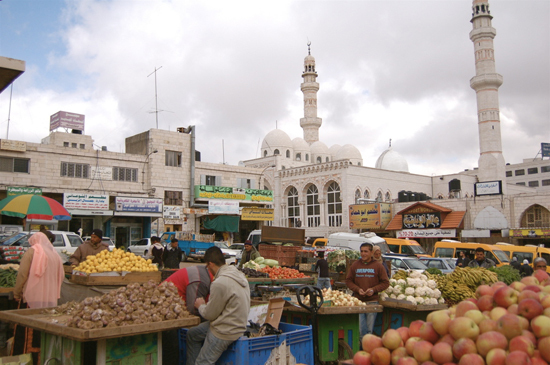 No Home Depots, DIY shops, or facsimiles in Ramallah. One sunny day I set out on my quest and stroll through town, poking my head into shops to see if there’s anything resembling curtain hardware for sale. People do have draperies here, so there must be a place to buy the necessary stuff. And certainly there is. Finally I discover a tiny shop with all sorts of curtain-type things and rods and bars and shower hooks. I rush in full of joy and expectation, hoping to find among the available hardware a tension rod of some sort, so that after pointing it out to a sales person, I can use my hands and feet to explain what I need in terms of length and size. The shop is empty except for a man I guess to be in his sixties. He sits leisurely in the corner drinking a minuscule cup of Turkish coffee and after we exchange the standard greeting involving words like marhaba and kiffalik, he watches me calmly as I scrutinize his wares. He drinks his coffee and watches me. And watches me. I don’t see any tension rods. It is very quiet in the shop, since I’m not speaking, not asking questions as any normal person would. I just don’t know what to say. It’s nerve-racking. It makes me think of Ralph Waldo Emerson. No, I don’t usually think of Ralph Waldo Emerson when I’m a nervous wreck, but I just happened to read a quotation of his this morning that goes like this: No man should travel until he has learned the language of the country he visits. Otherwise he voluntarily makes himself a great baby–so helpless and so ridiculous. So here I am, a big baby, helpless and ridiculous, looking for curtain rods. I should go home, study Arabic for seven years, and then come back and look for tension rods. The man stands up from his chair and takes a step in my direction. “What exactly is it you’re looking for?” he says in fluent American English. I am so taken aback, I stare. He laughs. I swallow hard. “I need tension rods,” I say in a baby voice, “to hang up light curtains.” I don’t know what happened to my grownup voice. I swallow again. Relieved as I am that I can speak English to the man, I am disappointed he doesn’t have what I want. I give a sigh of defeat. “I guess I’ll get them next time I’m in the States.” Whenever that might be. “Are you American?” I ask. Yes, he is. Passport carrying. His name is George and he begins to tell me his story, which is rather long so I’ll give you the nut-shell version: A Palestinian by birth, he’d come with his parents to the US as a young boy, gone to high school, become an American, married, had children. Then, after all that, his daughter married a West Bank Palestinian and moved to Ramallah. 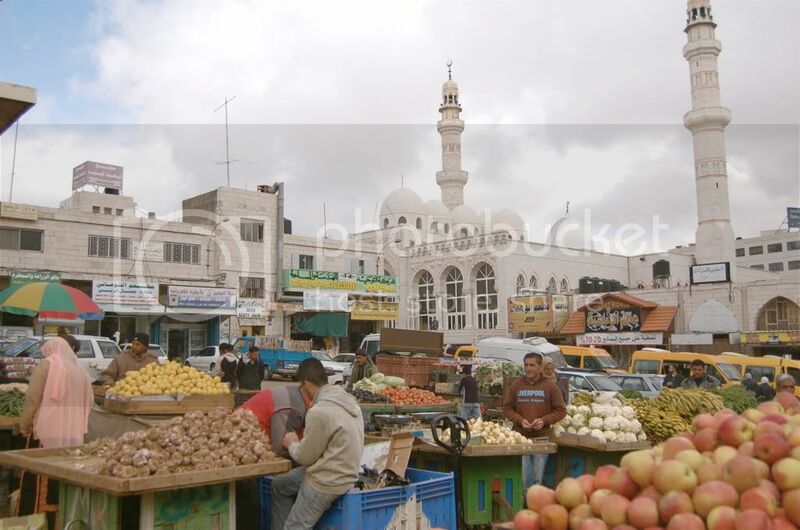 Finally, after retirement, George decided to come to Palestine too, open a shop, and here he is, back in the homeland, enjoying being grandpa to his grandchildren and hoping for a lasting peace. He brews me a cup of thick cardamom-flavored coffee and we talk for a while, until a customer comes in and in rapid Arabic tells him exactly what she wants. I say goodbye and step out into the sunny street. Feeling cheerful in spite of failure, I stop by Zabaneh grocery store to buy a bottle of Bethlehem wine. In the store I run into Laila. Laila is a new Palestinian friend who has taken me to the outdoor vegetable market, has shown me where to get my hair cut, and is now happy to see me because she wants to invite us to a traditional Palestinian dance performance of her children. After we chat for a while, in English, I stroll back home. Past the shwarma store and the sweet shop and some old men smoking water pipes and playing backgammon on the sidewalk. Up the hill, past kids doing daredevil things on their bikes, and through the open gate. I climb the stairs to the apartment, watching the Samarian desert come into view as I move higher. The Lutheran church chimes the half hour as I open the door and go inside. Pink carpeting and a beautiful view greet me. I put the wine in the fridge. So I was not at my competent best this afternoon. Never mind. I am happy. My exploration into town didn’t get me what I set out to find. Instead of curtain rods, I got a cup of coffee, a story, and an invitation. The trick is, as Marcus Aurelius said, that thou should not think so much of what thou hast not, as of what thou hast. NOTE: In the end, yes, I acquired tension curtain rods in the US and carried them back to Ramallah. They worked like a charm, and it was a cheap solution. And now please tell me your stories. Don’t make me think I’m the only one who feels incompetent and that all of you are smarter and wiser and never have these sorts of experiences. I enjoy your blog. My husband was a foreign service officer for years, and since retirement he works for USAID as a contract hire. I think you’ll probably find more expats in the DC metro area than any other one place but of course many retire to some state where a son or daughter has put down roots. I have heard that quite a few end up in florida. We live in Northern Virginia now, which we like very much, but I confess I do miss the old days overseas.